The SynGas Heat Module with ORC offers all the advantages of the SynGas Heat Module with the added benefit of power generation. The so-called Organic Rankine Cycle drives a small turbine with generator for power generation from the waste heat from the synthesis gas combustion. Although the amount of electricity produced is considerably lower than with the SynGas CHP module, there is also much more heat left to dry the sludge. 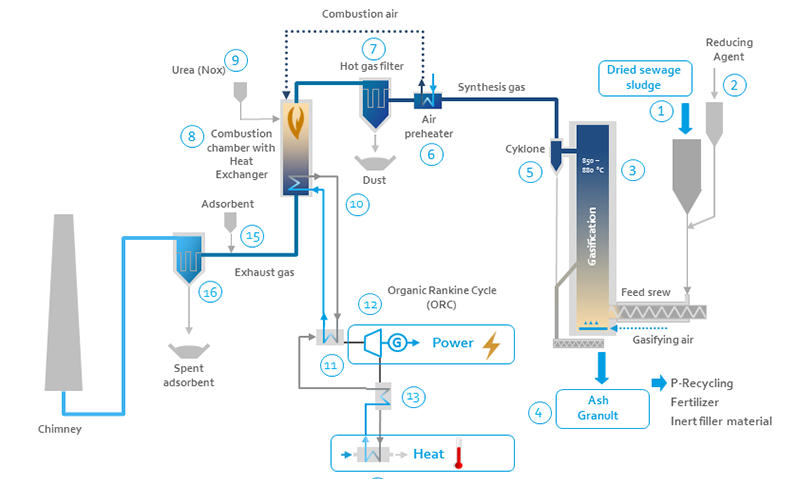 Depending on the quality of the sludge, the entire drying and gasification system can still remain thermally self-sufficient or only slightly dependent on additional heat. The electricity generated covers the gasification’s own consumption completely and additionally about half of the power required to operate the dryer. The cooled and de-dusted synthesis gas is burnt in a combustion chamber (8). The heat generated during combustion is provided for heating thermal oil by means of heat exchangers (10). In another heat exchanger (11), an organic working medium is evaporated for use in an ORC-turbine (12). The condensation heat of the working medium is used recuperatively for preheating (13) and for decoupling low-temperature heat (14). This variant is used when other energy is available for sludge drying on site. The combustion chamber is equipped with a urea injection (9). The urea serves to reduce nitrogen oxide emissions to the limit values specified in accordance with 17th BImSchV. 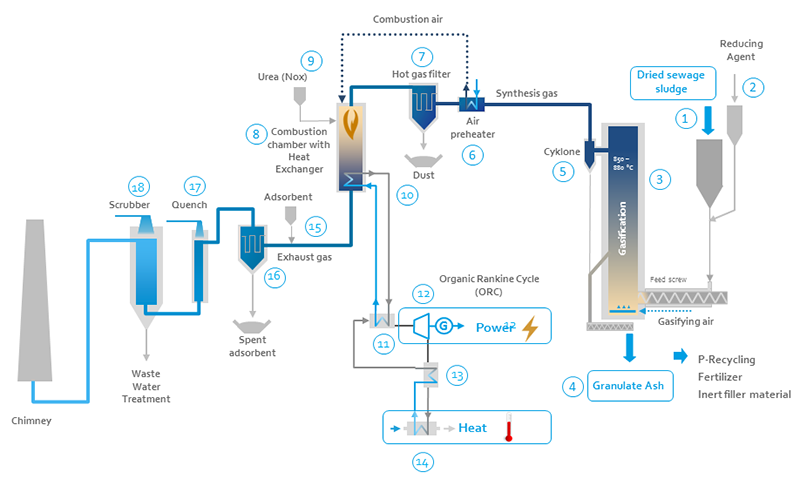 In a compact flue gas cleaning plant, environmental pollutants originating in the sewage sludge and remaining in the flue gas after synthesis gas combustion (among others as oxidised products) are removed e.g. Sulphur oxides and heavy metals. First, an adsorbent (15) is entrained in the flue gas to incorporate heavy metals, which are subsequently removed from the process at the fine filter (16). The further treatment of the flue gas for cooling and reduction of the sulphur compounds takes place in a quencher (17) and an alkaline scrubber (18). After pre-treatment, the wastewater is discharged to the wastewater treatment plant. The cooled and de-dusted synthesis gas is burnt in a combustion chamber (8). The heat generated during combustion is provided for heating thermal oil by means of heat exchangers (10). In another heat exchanger (11), an organic working medium is evaporated for use in an ORC-turbine (12). The condensation heat of the working medium is used recuperatively for preheating (13) and for decoupling low-temperature heat (14). This variant is used when other energy sources are available for sludge drying on site. The combustion chamber is equipped with urea injection (9). The urea serves to reduce nitrogen oxide emissions to the limit values specified in the 17th BImSchV (17th German Federal Pollution Control Ordinance). In a compact flue gas cleaning plant, environmental pollutants originating in the sewage sludge and remaining in the flue gas after synthesis gas combustion (among others as oxidised products) are removed. An adsorbent (15) is entrained in the flue gas to incorporate heavy metals and sulphur oxides, which are removed from the process at the fine filter (16).